Burroughs merged with the infinite in 1997 but his literary legacy and cultural prominence still stands firm and proud. As one of key inquisitors of the Beat movement, Old Bull Lee (a pseudonym that he and his peers used) presided over the Beatniks with a bloodshot but steel-eyed stare. He was both brutally honest about his “junk” dependency yet took fantastical cut up creative kicks.Interzone was the netherworld which he conjured and inhabited - partly 1950s Tangier in Morocco and partly the world that he slipped into when he was dreaming or hallucinating. Burroughs' stateless city of Interzone is a vast visual realm of inspiration. It was a perfect opportunity to bring something very special together. 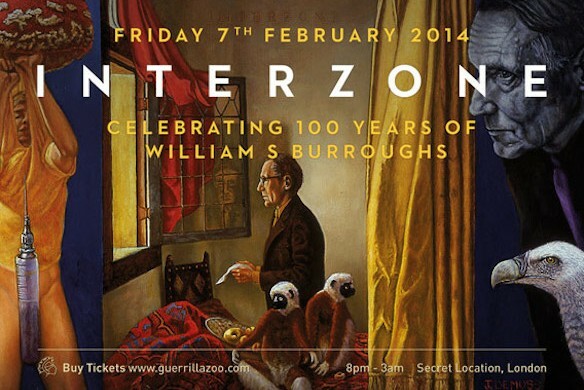 In 2008 Guerrilla Zoo did our previousInterzone event, which was picked up by the papers and was a great success. I'm not kidding, it has been cited by many as "best night out in London ever. Ever!" So with this being Burroughs' centenary year I thought for one night only, to open the doors to the city once more. This is an experiential event on many levels but also a party to celebrate Burroughs 100th birthday. Buy your ticket to travel. Pack your Passport. Step into a microcosm of all the world by moonlight. James Elphick: I'm not adapting word for word like a play, Interzone is an interpretation, inspired by the many universes of Burroughs writings. Much like how David Cronenberg's adaptation ofNaked Lunch was part novel, part biographical, part Cronenbergian dreamworld!